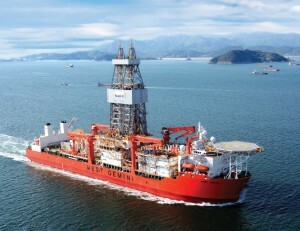 The West Gemini ultra-deepwater drillship will operate in West Africa for Total through September 2012; the operator has the option extend the contract for another year. The tide is turning for offshore drilling. An outlook that six months ago was on a flat-to-downward trajectory is showing what many in the industry believe is the beginning of a turnaround. Buoyed by signals that the global recession is fading, an increase in oil prices, increased global energy demand and the call for new, more sophisticated rigs to construct increasingly complex wells, drilling contractors are feeling generally optimistic about the current and near-term offshore drilling market. Newbuild activity, particularly for jackups, is robust, with several companies ordering new rigs for delivery over the next two to three years and planning to ramp up their work forces. 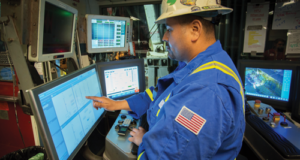 Rig utilization is expected to recover, as are dayrates, with operators willing to pay higher rates for rig designs that feature improved safety, more automation and greater hoisting and pipe-handling capacity at greater depths and in harsher environments. 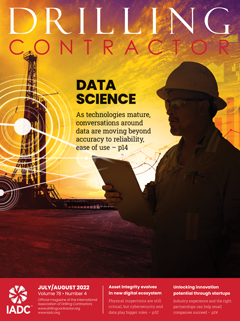 Despite concerns about unrest in the Middle East and frustration over the pace at which permits are being issued for post-Macondo Gulf of Mexico, contractors believe they are at the dawn of an uptick in business in most regions, including the newest deepwater frontiers – West Africa and Brazil. “We’re starting to see evidence of a recovery coming, particularly in the jackup space,” said Tim Juran, executive vice president, Seadrill Americas, which focuses on ultra-deepwater drilling but also owns one of the world’s largest modern jackup and tender drilling fleets. “Plans by operators outside the Gulf of Mexico look quite encouraging,” he noted. 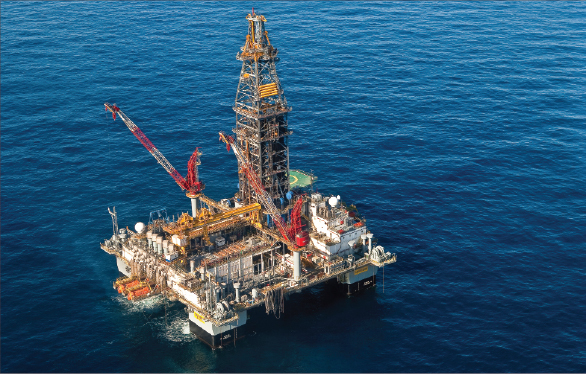 Seadrill’s 18 jackups have, until recently, been deployed primarily in Southeast Asia and the Far East, but the company is seeing opportunities in West Africa and the Americas. 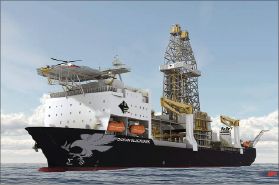 The Ocean BlackHawk (rendering) ultra-deepwater drillship is scheduled to be delivered to Diamond Offshore in Q4 2013. The vessel will be capable of operating in 12,000-ft water depths. 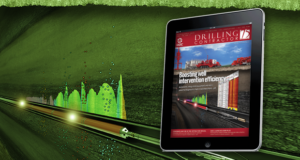 In the meantime, Seadrill’s deepwater fleet is deployed in Brazil, the North Sea, Far East and West Africa. Nigeria and Angola, along with a number of smaller countries, offer strong near- and long-term opportunities, despite ongoing logistical challenges to procure the key support organizations and partners to meet government requirements, Mr Juran said. “We are extremely active in both the deepwater and the jackup space,” he said, noting that Seadrill has taken delivery of 11 deepwater rigs since 2007 and has three more on order with two additional options. 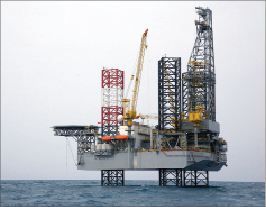 The company also recently acquired two rigs that were owned by Seadragon, with the first of those delivered in March. “We will take delivery of five newbuilds later this year,” he said. Last year, Seadrill also acquired a controlling interest in Scorpion Offshore, assimilating that company’s seven jackups into its fleet. “The push is on expanding the drilling envelope in terms of well depths, water depths and improving the efficiency with which wells can be constructed,” Mr Juran continued. “In our fleet, growth has been characterized by moving away from moored, upgraded deepwater rigs to fully dynamically positioned rigs with all the control and interface technology that goes along with that. In the jackup sector, the bifurcation in the marketplace continues, driven in large part by an aging worldwide jackup fleet, with many of those rigs reaching the end of their viable economic lives. “As long as that bifurcation continues, we are not concerned about capacity or overbuilding,” Mr Juran said. To service its newbuild deliveries, Seadrill plans to hire at least 1,000 workers over the next 18 months. Diamond Offshore’s Ocean Endeavor semi has been mobilized out of the US Gulf of Mexico and is on contract to Burullus Gas offshore Egypt. One of fastest-growing deepwater markets is Brazil, which is also the largest market for Diamond Offshore Drilling. 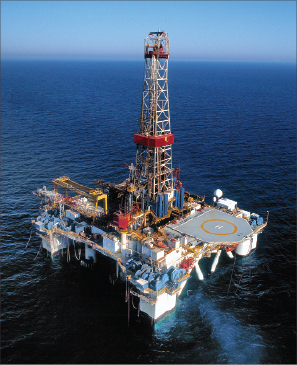 The company has ultra-deepwater presence in the pre-salt and is active in mid-water depths, with 16 offshore rigs displaying the Black Diamond logo. Recently, two new sixth-generation rigs, the Ocean Courage and Ocean Valor, began operations for Petrobras. 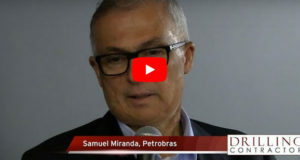 “In addition to drilling for Petrobras, we are active with the new company, OGX,” said Lyndol Dew, senior vice president. Worldwide utilization of the company’s 38 marketed rigs is at 97%. Two high-spec drillships – the Ocean BlackHawk and the Ocean BlackHornet – designed to operate in water depths up to 12,000 ft, are on order with deliveries scheduled for 2013. Specs for the new drillships include features that Mr Dew says will add value for operators. 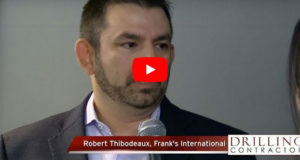 “We’ve specified a seven-ram blowout preventer, which will give us a lot of flexibility depending on what may be mandated by the latest government and/or operator requirements,” he said. “We’ve also chosen five mud pumps, giving us three pumps on the hole, one on the riser and one spare.” The drillships also include larger quarters, for 210 people. The ultra-harsh environment jackup Maersk Inspirer is capable of operating in water depths up to 150 meters. It is currently working as a combined drilling and production unit in Norway. Hydrocarbons are processed on the rig itself, and gas is transferred by pipeline to a floating storage and offtake vessel. The new jackups offer a package that includes a fully remote-operated pipe-handling system; a top drive capacity of 1,000 tons to drill to 35,000 ft; extended cantilever reach to a record 110 x 80 feet; dual mud system; derrick capacity that allows drill pipe to be racked in quads and casing stands in triples; and a large drive pipe support deck to support a 150-ton vertical load and 100-ton horizontal load. In keeping with Maersk Drilling’s culture of prioritizing safety and environmental compliance, the green rig design features energy efficiency and controlled discharge specifications to reduce the carbon footprint, and waste heat recovery systems to retain and utilize some of the thermal energy that normally is lost. 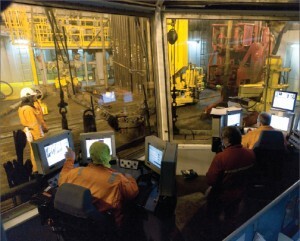 On the Maersk Inspirer, drillers have a full view of rig floor operations from the driller’s cabin. 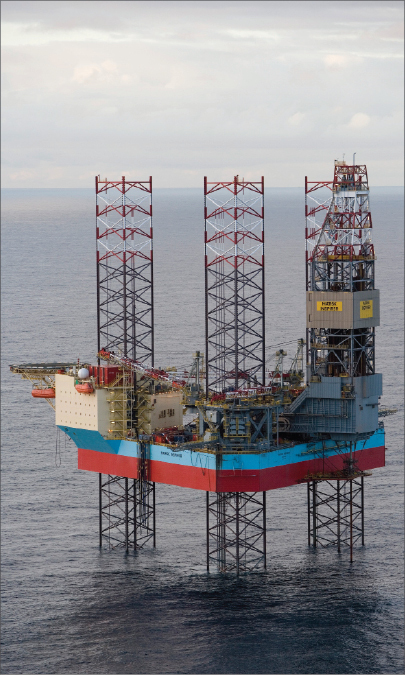 The ultra harsh-environment jackup Maersk Innovator is working under an eight-year contract in the Norwegian North Sea. The unit is designed to drill subsea wells in addition to traditional surface-completed wells. 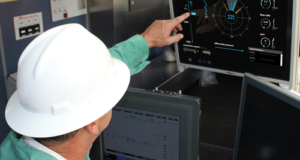 Atwood Oceanics has bolstered its personnel training and competency assurance efforts since Macondo to support an anticipated sustained business uptick and the company’s high-specification newbuild activity, which includes three ultra-deepwater rigs and three jackups. 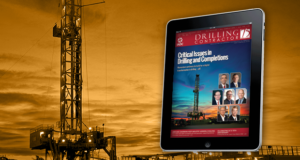 “Most E&P operators believe high oil prices are here to stay, so they are increasing their exploration budgets and extending their presence in offshore drilling,” said president and chief executive officer Robert Saltiel. The semisubmersible Atwood Hunter, capable of drilling in 5,000-ft water depths, is working in Equatorial Guinea. The outlook for Africa remains somewhat mixed, with unrest in North Africa curtailing offshore drilling plans for the Mediterranean Sea, and regulatory uncertainty remains a challenge in Nigeria, Mr Saltiel continued. The jackup Atwood Aurora, capable of drilling in 350-ft water depths, is working in Egypt. Atwood’s ultra-deepwater newbuilds reflect an evolution of proven technologies, offering such features as high-torque top drives for drilling deeper wells in deeper waters with broader safety margins; enhanced BOP stack configurations and capabilities for improved well control; larger cranes for deployment of subsea trees; and larger quarters for additional personnel. The company’s jackup newbuilds are suitable for drilling in all major basins that are not harsh environment, and they will provide clients with larger deck space, expanded fluids storage, offline tubular handling and 150-person accommodations, among other features. The dynamically positioned semisubmersible Atwood Condor, expected to be completed in 2012, will be capable of drilling in 10,000-ft water depths. The Atwood Osprey semisubmersible will be delivered from the Jurong shipyard this spring and begin a three-year program drilling the Greater Gorgon development in Australia for Chevron and its partners. 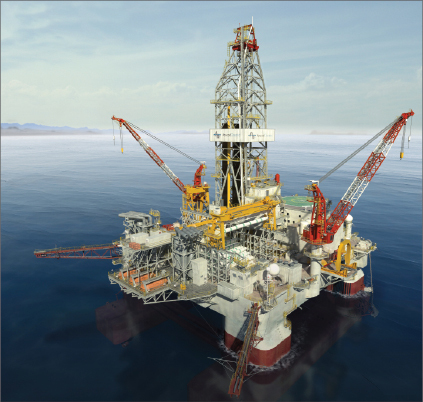 The Atwood Condor, a 10,000-ft water depth semisubmersible with an enhanced drilling package and well control system, is scheduled for delivery by mid-2012. The Atwood Advantage, an ultra-deepwater drillship with dual-derrick drilling capabilities for water depths up to 12,000 ft, is set for delivery in September 2013. The Atwood Mako, Atwood Manta and Atwood Orca – Pacific-class 400-ft jackups being constructed at PPL Shipyard in Singapore – are set for delivery in September 2012, December 2012 and June 2013, respectively. As evidenced by the recent announcement of its planned acquisition of Pride International, Ensco will become the second-largest offshore drilling company in the world, with the youngest fleet of ultra-deepwater rigs, said senior vice president Mark Burns. 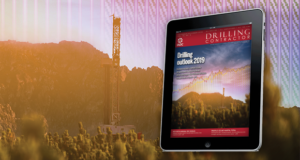 “With the rise in oil prices and the significant investments being made in the deepwater sector, we are optimistic about future drilling demand,” Mr Burns said. The Atwood Osprey newbuild semi will be mobilized to Australia upon delivery from the Singapore shipyard. The unit has already been contracted to Chevron Australia for at least three years and up to six years. 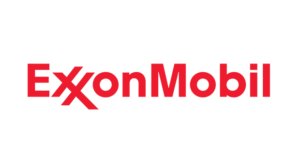 Together, the two companies have seven rigs under construction, which will require a significant increase in staffing and provide many career advancement opportunities for current employees. “Pride has a major presence in some of the largest and fastest-growing markets, such as Brazil and West Africa. Pride also has drillships, which we do not,” Mr Burns noted. “Pride will benefit because we have the largest fleet of active premium jackups in the world, and Ensco is a dominant player in places like Asia and the North Sea. So this is a very good fit. 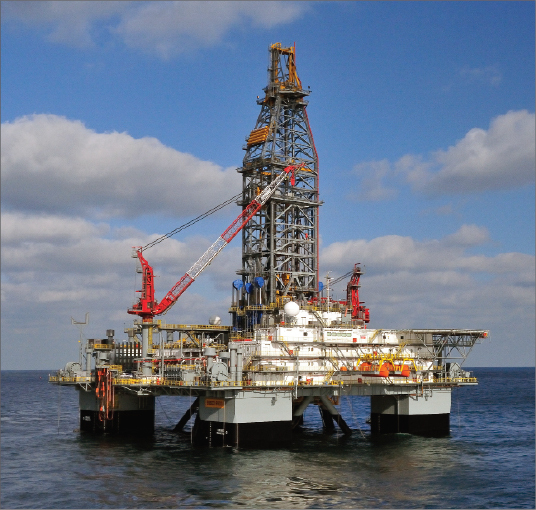 In the shallow-water market, two of Ensco’s jackups were the first to be approved to drill GOM wells under new regulatory requirements. “We have been proactive and worked very hard to comply with the new safety requirements,“ Mr Burns said. Ensco expects to see utilization of its total premium jackup fleet in the low 80 percentage range by the end of the year. The dynamically positioned ENSCO 8501 ultra-deepwater semisubmersible rig is resuming drilling in the US Gulf of Mexico for Noble Energy. The unit is capable of drilling in up to 8,500-ft water depth. A key growth area in the shallow-water sector will be high-pressure, high-temperature (HPHT) wells, particularly in the North Sea, Mr Burns said. 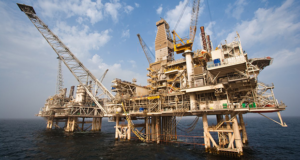 Ensco has two ultra-premium, harsh-environment jackups on order, both scheduled for delivery in 2013, and options for two more. The rigs will be operational in water depths up to 400 ft, will have HPHT equipment, a 2.5 million-lb quad derrick and fully automated pipe-handling systems. The ENSCO 8503 has mobilized out of the Gulf of Mexico to French Guiana, sublet to Tullow Oil. Shallow-water contractors also are cautiously optimistic about prospects in the Gulf of Mexico, where, by the end of March, more than 30 permits had been issued by the US Bureau of Ocean Energy Management, Regulation and Enforcement (BOEMRE) since the moratorium was lifted. Hercules is marketing 11 jackups for the GOM, with 10 contracted. A bigger concern is the price of natural gas. “That is the big challenge we still face in the Gulf of Mexico,” Mr Rynd said. “Natural gas is the primary driver for our customers in shallow water GOM. To gain more confidence, we need to see natural gas prices move closer to $5/mcf.” But, with the significant level of land drilling in US shale plays, he does not see that shift occurring in the next six to 12 months. 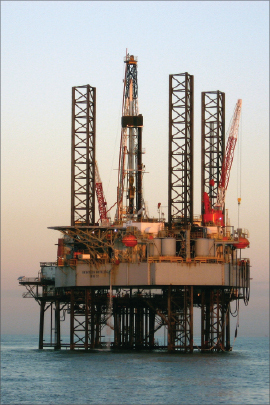 The Hercules 173 jackup is working in the US Gulf of Mexico for Chevron. Hercules Offshore is marketing 11 jackups for the Gulf, with 10 contracted. On a more positive note, Mr Rynd said the recent increase in oil prices is motivating customers to spend more, resulting in what he sees as the beginning of a global up cycle. He noted, however, that the recent run-up in oil prices to more than $100/bbl in response to upheaval in the Middle East comes with risk. 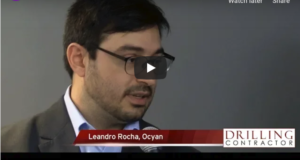 The industry is optimistic about the outlook for the global jackup market, which likely will be led by international business, Mr Rynd believes. “Overall, we’re poised for a global recovery in utilization. As large oil companies such as PEMEX, ONGC, Saudi Aramco, Chevron, Shell and ExxonMobil start to ramp up their activity, we anticipate growth in rig demand,” he said. Hercules has two jackups contracted to ONGC in India, two contracted to Saudi Aramco, one contracted to Murphy Malaysia, and one to Chevron Angola. 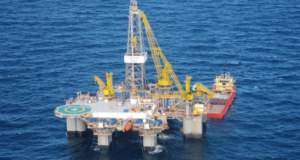 One platform rig is contracted to PEMEX. 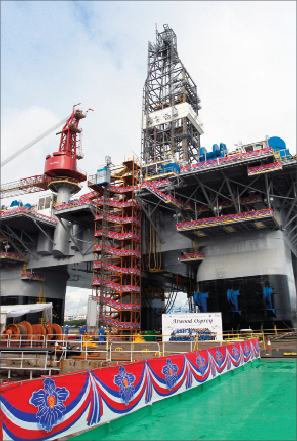 The Hercules 350 cantilever jackup is contracted to Chevron in the Gulf of Mexico. He believes the age of the jackup fleet and the rate at which older rigs are being retired will offset the potential for oversupply. 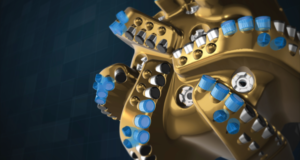 Earlier this year, Hercules purchased the assets of Seahawk Drilling and formed, and owns 8% of, Discovery Offshore, a Luxembourg-based company specializing in ultra high-specification jackups. 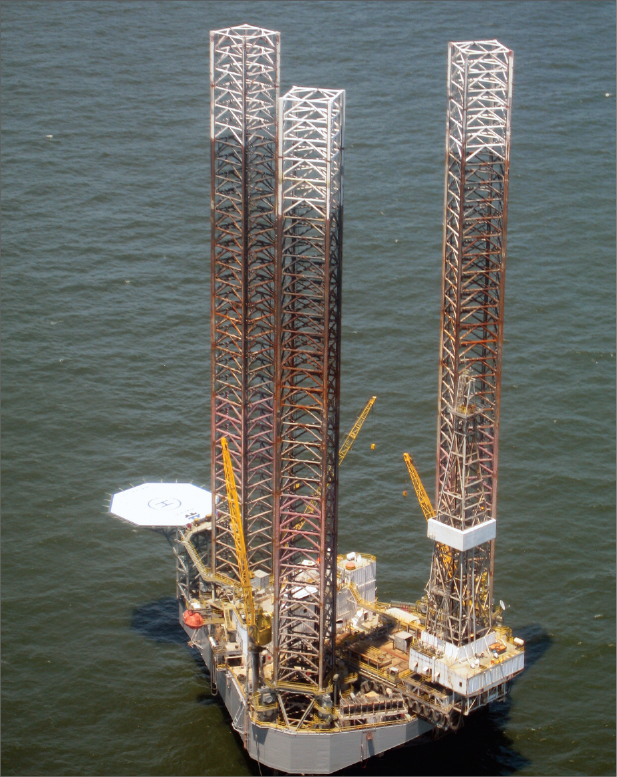 Two such rigs, both for use in harsh environments, are on order from the Keppel FELS shipyard in Singapore and scheduled for delivery in Q2 and Q4 2013. The company has fixed-price options, which must be exercised in July and October this year, for two more high-spec rigs, for delivery in 2014. “We felt the timing for this investment was right, as we believe we’re in the early stages of a nice recovery in our business,” Mr Rynd said. ENSCO 8500 Series is a registered trademark of Ensco. 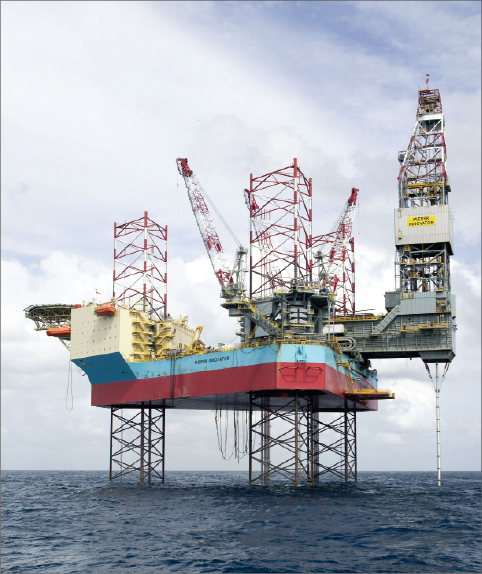 Left: The ultra-harsh environment jackup Maersk Inspirer is capable of operating in water depths up to 150 meters. It is currently working as a combined drilling and production unit in Norway. Hydrocarbons are processed on the rig itself, and gas is transferred by pipeline to a floating storage and offtake vessel. Above: On the Maersk Inspirer, drillers have a full view of rig floor operations from the driller’s cabin.